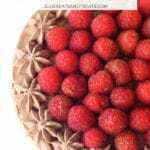 If you are looking for a quick, easy and impressive dessert recipe you have got to make this No Bake Raspberry Chocolate Cheesecake! It has an amazing Oreo crust, creamy chocolate Cheesecake and is Topped with Fresh Raspberries and Chocolate Whipped Cream! Who wouldn’t love that combination? Make it for dessert today! My travels to the States are my inspiration and I am in my happy place when I’m eating s’mores, drinking cereal milk and concocting calorie-laden desserts. 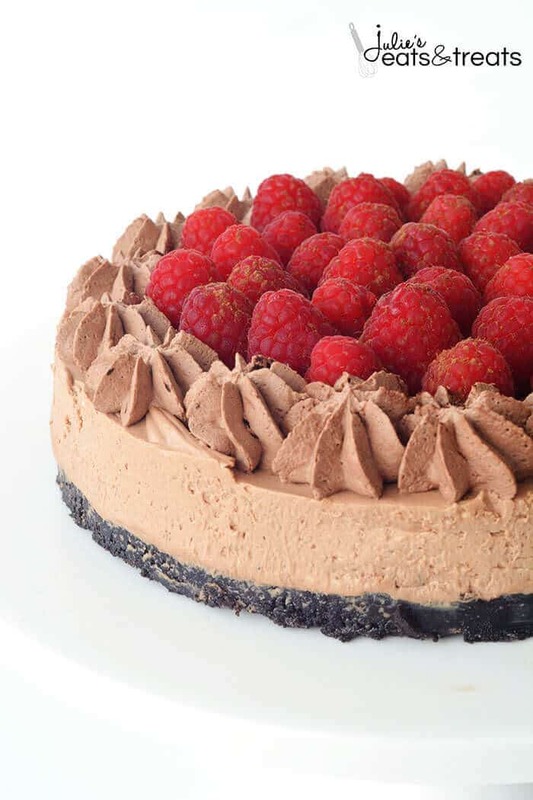 Today I’m sharing one of my new favorite no-bake recipes with you – a truly decadent Raspberry Chocolate Cheesecake. This beautiful dessert has an Oreo crust (yes please) and is filled with creamy chocolate cheesecake, topped with fresh raspberries and then finished with a little extra chocolate whipped cream. Perhaps this easy dessert could make an appearance on your Valentine’s Day table this year? Over here in Australia, it is summer and it is HOT. Which is why I love to make no-bake sweets that taste amazing without even having to use the oven. 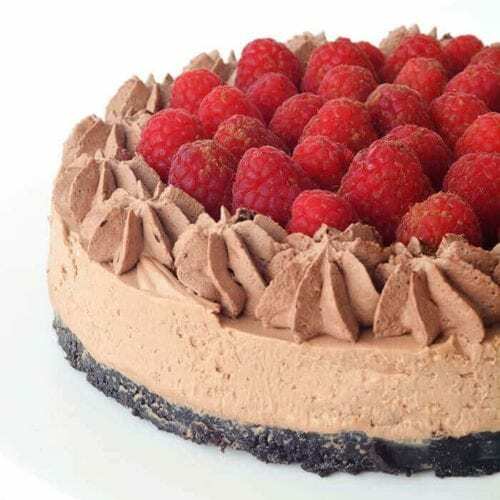 And this Raspberry Chocolate Cheesecake is no exception. 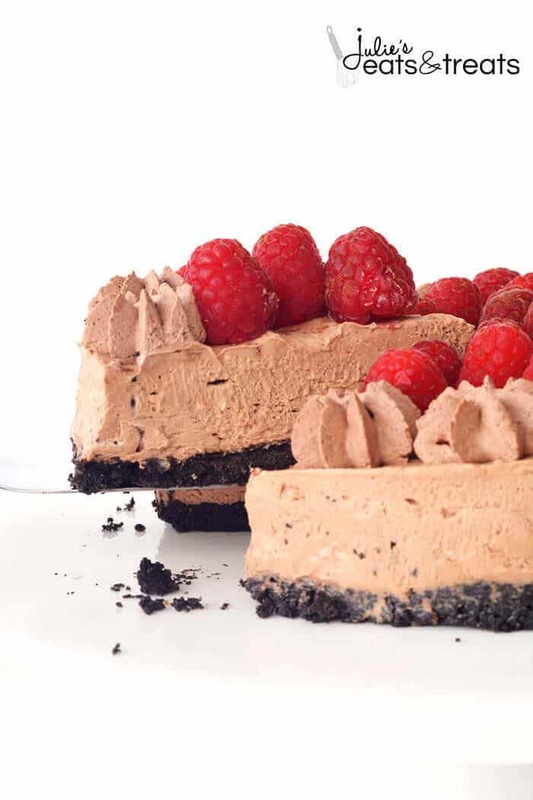 The creamy and rich chocolate cheesecake filling blends beautifully with the tart, fresh raspberries and the thick chocolate Oreo crust just sends it over the top. Your friends and family will be begging for seconds! Valentine’s Day in Australia isn’t that big of a deal but I have been in America twice on Valentine’s Day and I KNOW it is over there. Those chocolate displays in Target are really something else. This time last year we were actually just arriving home after a big trip across America #memories. Whether you are sharing this dessert with a loved one, friends, family or no one at all, I just know you will enjoy it. Beware though, it’s hard to stop at just one piece! Is No Bake Cheesecake better than baked cheesecake? Baked cheesecake is dense and more like custard. No-bake cheesecake is lighter and fluffy – think mousse. Is one better than the other? I think it’s more about personal preference! Does No Bake Cheesecake need to be refrigerated? Yes, you will need to refrigerate this cheesecake! Also be sure and wrap it well in plastic. It will keep better and be fresher when well sealed and refrigerated for up to five days. Yes, just wrap it well and tuck it into the freezer! Then when you need a sweet treat, grab a slice and enjoy! 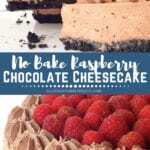 I also love that this easy No Bake Cheesecake can be changed up with your flavor preferences. You can totally top this with strawberries if those are more you thing or even some shaved chocolate and leave the fruit off! Another great idea would be crushed Andes mints sprinkled on top for a mint twist! Lightly grease a springform baking tin with butter and set aside. Add your Oreo cookies to a food processor and blend until they resemble fine crumbs. Melt butter in the microwave and then pour over the crushed Oreos and process again until the mixture resembles wet sand. Place the crust into the prepared tin and press down gently to form an even layer and refrigerate. Next add the softened cream cheese, caster sugar and vanilla to a large mixing bowl and beat with an electric beater until smooth and creamy. In a separate bowl, add your cream and beat with an electric beater until whipped and soft peaks form. Finally, melt your dark chocolate in the microwave until it is just melted. Then add the chocolate to the cream cheese mixture and beat until smooth. Gently fold through the whipped cream until the mixture is smooth. Pour your cheesecake mixture over the Oreo crust and refrigerate for at least 4 hours. 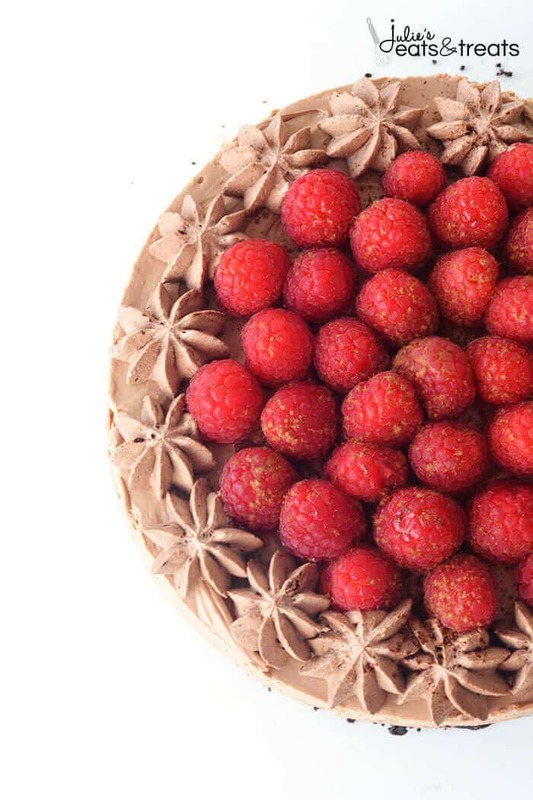 Decorate with chocolate whipped cream and fresh raspberries. Dreamy, creamy and delicious, right? I know you’re going to love this recipe! More of my favorite cheesecake recipes! See? Cheesecake is definitely a thing here! And isn’t this the most gorgeous dessert? What a showstopper! Be sure and comment with a five-star rating below or better yet? Snap a photo so I can see the gorgeous centerpiece on your table! On Instagram? Be sure and tag me at @julieseatsandtreats or #julieseatsandtreats. Delicious, Easy Chocolate Cheesecake with a Delicious Oreo Crust, Creamy Chocolate Cheesecake and Topped with Fresh Raspberries and Chocolate Whipped Cream! Lightly grease a 9 inch springform baking tin with a little butter and set aside. Add your Oreo cookies (cream and all) to a food processor and blend until they resemble fine crumbs. Melt your butter in the microwave and then pour over your crushed Oreos and whiz again until the mixture resembles wet sand. Place your Oreo mixture into your prepared tin and press down gently on the bottom of your tin to form an even layer. Pop in the fridge. Add your softened cream cheese, caster sugar and vanilla to a large mixing bowl and beat with an electric beater until smooth and creamy. In a seperate bowl, add your cream and beat with an electric beater until whipped and soft peaks form. Finally, melt your dark chocolate in the microwave until it is just melted - give it a good stir. Then add your chocolate to your cream cheese mixture and beat until smooth. Then gently fold through the whipped cream until the mixture is smooth. Pour your cheesecake mixture over the top of your Oreo crust and refrigerate for at least 4 hours or even better, overnight. To decorate, place your extra cream in a large mixing bowl and beat with an electric mixer until soft peaks form. Then sift in the icing or powdered sugar and the cocoa powder and gently fold through. Pop your chocolate cream in a piping bag fitted with a large star tip and pipe swirls along the edges. Decorate the top with fresh raspberries. Enjoy! Oh my! This looks amazing!! I’m not great at making dessert, so a no bake recipe is perfect when I need to make a treat for a special occasion. Hi Jess!! Um, girl you COMPLETELY nailed this gorgeous cake! I love that it’s no-bake and seriously, even though we’re supposed to get a ton of snow today, I’m ready for a slice! Wow! This cake looks gorgeous! raspberries and chocolate are one of those combos that are just magical. This cheesecake looks divine, and I love that its no bake too! I, too, love the raspberry and chocolate combination. Can’t wait to try, I know it will be fabulous. One question, though, the ingredients list 1and 1/2 cups thickened or heavy cream twice. Am I correct in assuming that is a misprint and the recipe only calls for 1 and 1/2 cups total and not three? Any advice on how the ratios would change to make this a white chocolate cheesecake? Chocolate and raspberry go so great together!!! 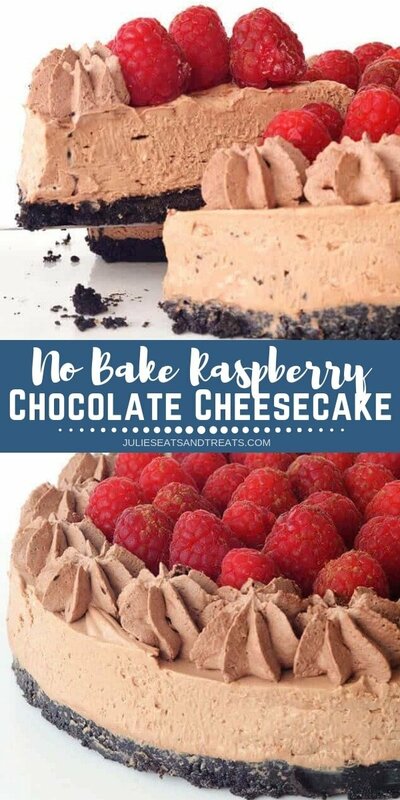 I am always looking for a delicious no bake cheesecake recipe! 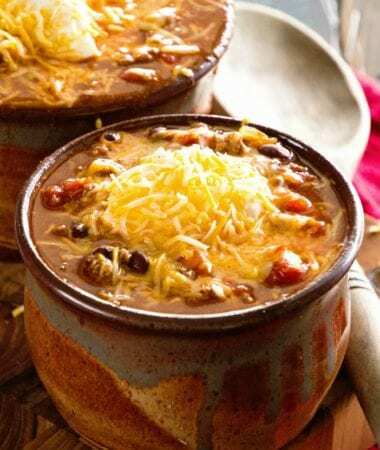 Totally love this recipe! We made it the other day and not one slice was left! Thank you!